Good old filter coffee is completely en vogue at the moment. However, it is difficult to prepare it by the cup, which is why many people opt for capsules that are harmful for the environment. That is why evoworkx has developed a miniature coffee filter called mycoffeebag that enables high-quality coffee to be brewed directly in the cup – hot water simply has to be added in order to enjoy the coffee that is hand-roasted by a coffee manufacturer. The coffee is produced in Germany in a coffee manufacturing company – the beans are roasted by hand using the gentle drum roasting method. 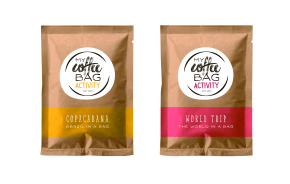 The manufacturer is certified in compliance with the DE-ÖKO guideline, the coffee bags are 100% compostable and several of the coffee types in the collection are bio-certified. The customising options of the product that was distinguished with a Promotional Gift Award 2017 in the category Give-aways are also extremely impressive: The aroma-proof wrapped single packages can be 4-colour imprinted in the desired design.